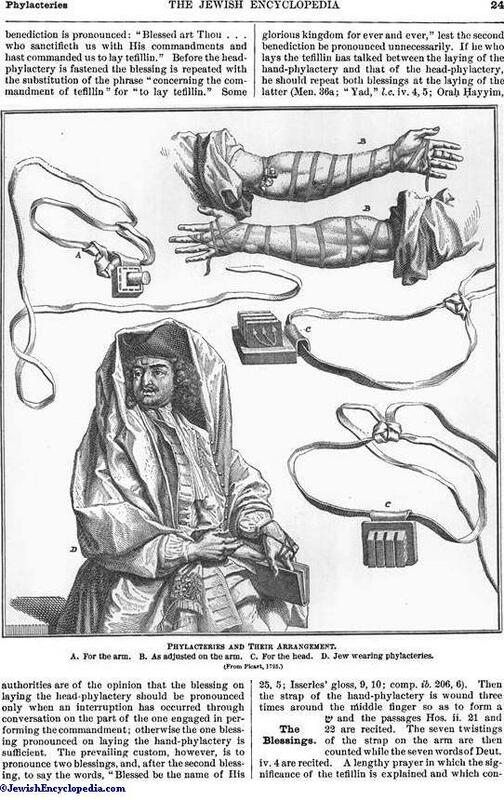 Phylacteries, as universally used at the present time, consist of two leathern boxes—one worn on the arm and known as "shel yad" (Men. iv. 1) or "shelzeroa'" (Miḳ. x. 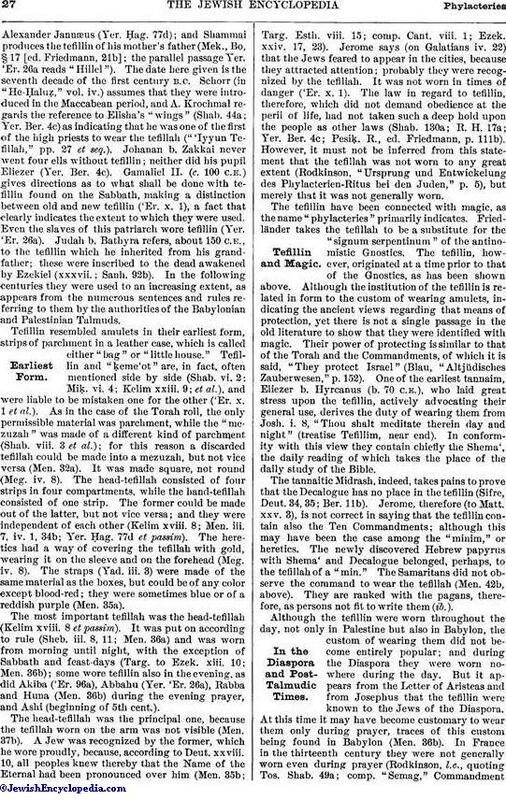 3), and the other worn on the head and known as "shel rosh"—made of the skins of clean animals (Men. 42b; Sanh. 48b; "Yad," l.c. iii. 15). The boxes must be square (Men. 35a); their height may be more or less than the length or the width ("Yad," l.c. iii. 2); and it is desirable that they be black (Shulḥan 'Aruk, Oraḥ Ḥayyim, 32, 40). The boxes are fastened on the under side with square pieces of thick leather ( ; Men. 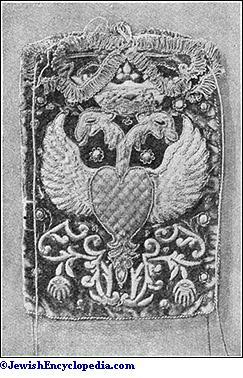 35a) by means of twelve stitches made with threads prepared from the veins of clean animals (Shab. 28b), and are provided with loops ( ; Men. 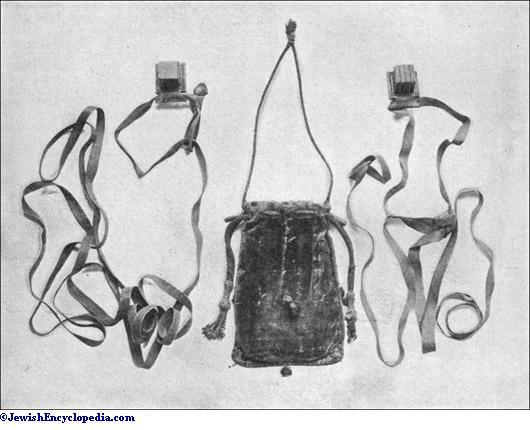 35a) at the ends, through which are passed leathern straps ( ) made of the skins of clean animals (Shab. 28b) and blackened on the outside (Men. 35a; comp. 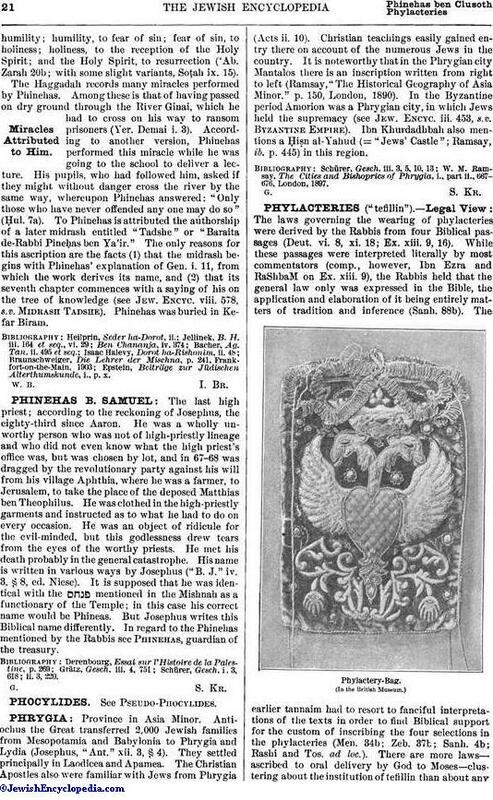 "Sefer Ḥasidim," ed. Wistinetski, § 1669). 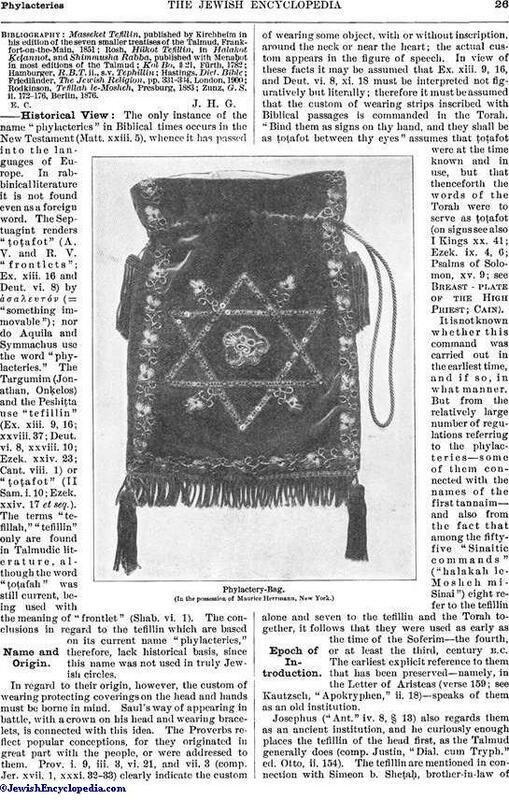 The strap that is passed through the head-phylactery ends at the back of the head in a knot representing the letter ד; the one that is passed through the hand-phylactery is formed into a noose near the box and fastened in a knot in the shape of the letter ש (comp. 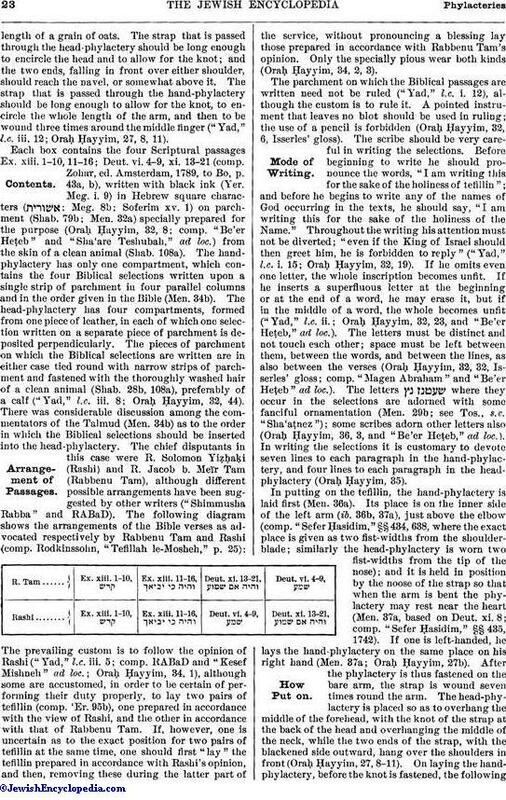 Heilprin, "Seder ha-Dorot," i. 208, ed. Maskileison, Warsaw, 1897, where a wonderful story in relation to the laws governing the making of these knots is told). The box containing the head-phylactery has on the outside the letter ש, both to the right (with three strokes: ש) and to the left (with four strokes: ש; Men. 35a; comp. Tos., s.v. 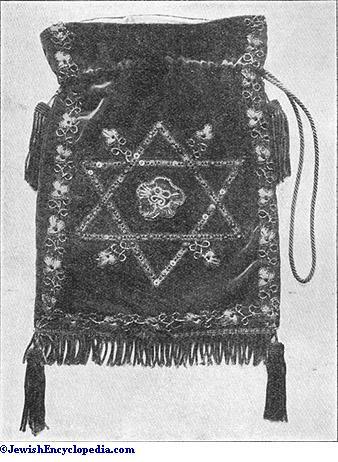 "Shin"; probably as a reminder to insure the correct insertion of the four Biblical passages); and this, together with the letters formed by the knots of the two straps, make up the letters of the Hebrew word "Shaddai" ( = "Almighty," one of the names of God; Men. 35b; Rashi, s.v. "Ḳesher"). The measurements of the boxes are not given; but it is recommended that they should not be smaller than the width of two fingers ('Er. 95b; Tos., s.v. "Maḳom"; Men. 35a; Tos., s.v. "Shin"). 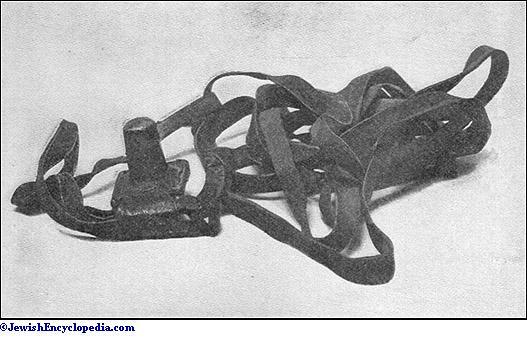 The width of the straps should be equal to thelength of a grain of oats. 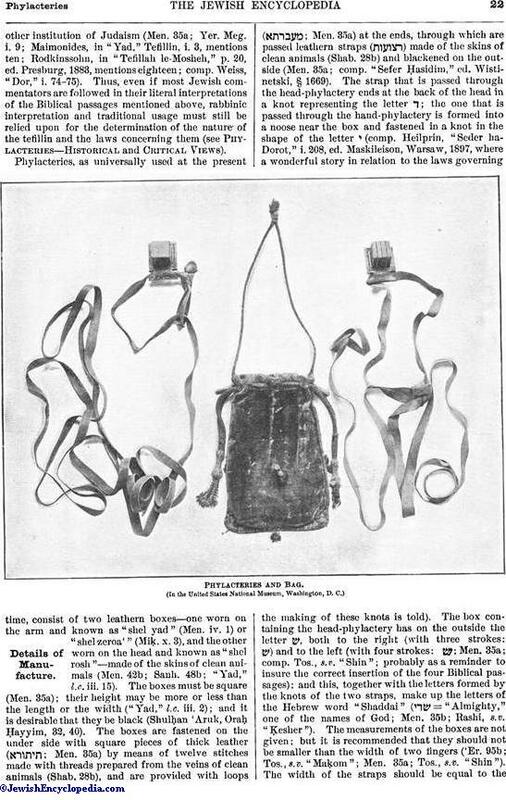 The strap that is passed through the head-phylactery should be long enough to encircle the head and to allow for the knot; and the two ends, falling in front over either shoulder, should reach the navel, or somewhat above it. 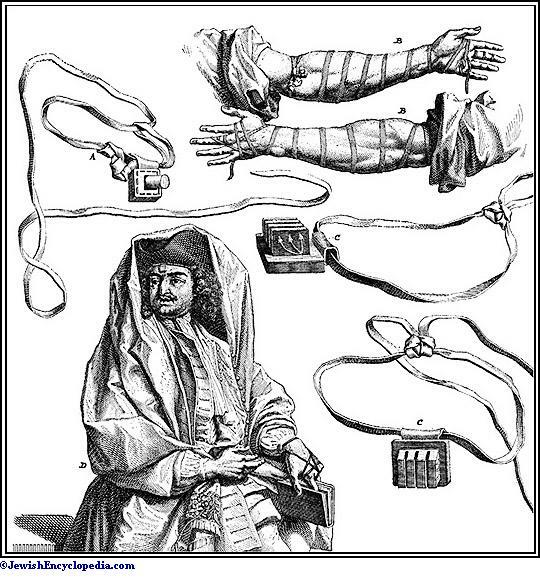 The strap that is passed through the hand-phylactery should be long enough to allow for the knot, to encircle the whole length of the arm, and then to be wound three times around the middle finger ("Yad," l.c. iii. 12; Oraḥ Ḥayyim, 27, 8, 11). Each box contains the four Scriptural passages Ex. xiii. 1-10, 11-16; Deut. vi. 4-9, xi. 13-21 (comp. Zohar, ed. Amsterdam, 1789, to Bo, p. 43a, b), written with black ink (Yer. Meg. i. 9) in Hebrew square characters ( ; Meg. 8b; Soferim xv. 1) on parchment (Shab. 79b; Men. 32a) specially prepared for the purpose (Oraḥ Ḥayyim, 32, 8; comp. "Be'er Heṭeb" and "Sha'are Teshubah," ad loc.) from the skin of a clean animal (Shab. 108a). The parchment on which the Biblical passages are written need not be ruled ("Yad," l.c. i. 12), although the custom is to rule it. A pointed instrument that leaves no blot should be used in ruling; the use of a pencil is forbidden (Oraḥ Ḥayyim, 32, 6, Isserles' gloss). The scribe should be very careful in writing the selections. 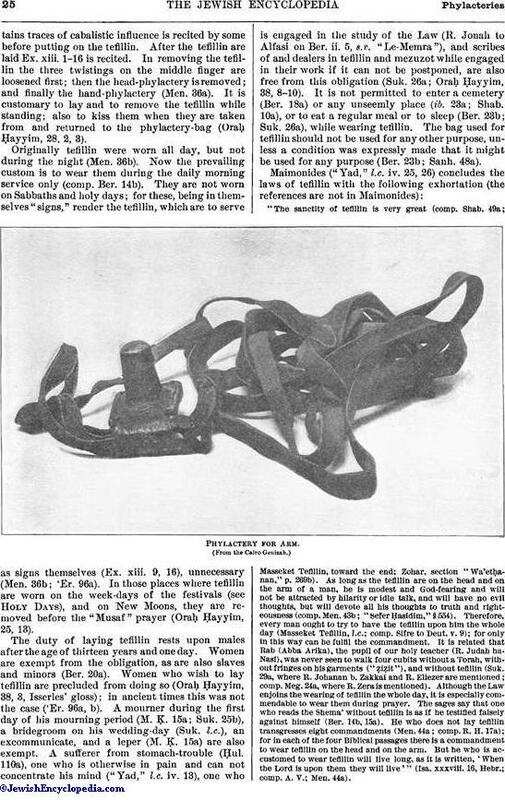 Before beginning to write he should pronounce the words, "I am writing this for the sake of the holiness of tefillin"; and before he begins to write any of the names of God occurring in the texts, he should say, "I am writing this for the sake of the holiness of the Name." Throughout the writing his attention must not be diverted; "even if the King of Israel should then greet him, he is forbidden to reply" ("Yad," l.c. i. 15; Oraḥ Ḥayyim, 32, 19). If he omits even one letter, the whole inscription becomes unfit. If he inserts a superfluous letter at the beginning or at the end of a word, he may erase it, but if in the middle of a word, the whole becomes unfit ("Yad," l.c. ii. ; Oraḥ Ḥayyim, 32, 23, and "Be'er Heṭeb," ad loc.). The letters must be distinct and not touch each other; space must be left between them, between the words, and between the lines, as also between the verses (Oraḥ Ḥayyim, 32, 32, Isserles' gloss; comp. "Magen Abraham" and "Be'er Heṭeb" ad loc.). The letters where they occur in the selections are adorned with some fanciful ornamentation (Men. 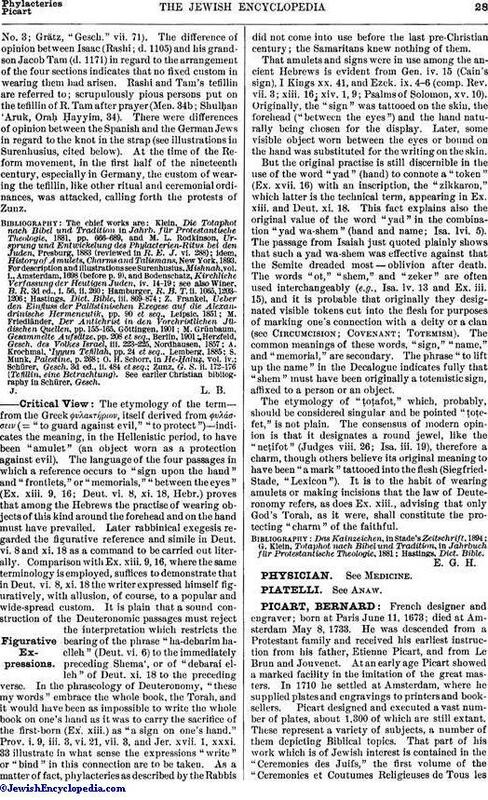 29b; see Tos., s.v. "Sha'aṭnez"); some scribes adorn other letters also (Oraḥ Ḥayyim, 36, 3, and "Be'er Heṭeb," ad loc.). In writing the selections it is customary to devote seven lines to each paragraph in the hand-phylactery, and four lines to each paragraph in the head-phylactery (Oraḥ Ḥayyim, 35).